Summary : This tea is just plain "different." Due to the licorice root in this tea, this is one of the sweetest teas I've ever had...despite having no sugar added. If you enjoy sweet teas...and also like teas that have a lingering sweet after-taste...you'll definitely like this Licorice Mint tea from the Dragonwater Tea Company (now out of business). Review : I love going to the movies. Since I can no longer eat the overpriced buttered popcorn at the movie theatres, I smuggle in some Twizzlers red licorice. Yeah, the movie theatres don't like it...but if you don't flaunt it, they won't know about it either. And some things in life are better left unsaid in any event. And so it happened that during my last order with the Dragonwater Tea Company (now out of business) I ordered a tea with an irrestible name, Licorice Mint, which is a herbal tea. I mean...who could want a better combination than that, right? The Licroice Mint Tea from Dragonwater Tea Company (now out of business) contains the following ingredients : licorice root, spearmint, and peppermint leaves. Despite all the mint ingredients, and the rather strong "minty aroma," this tea is still a licorice tea! True, this tea really does smell like a mint tea straight out of the bag. Probably no surprise, with hindsight, considering the strong aroma of peppermint and spearmint leaves...both of which are put into this tea. Yet, once brewed, the mint taste you expect to have mysteriously disappears. Instead, a licorice flavor that is very sweet and long-lasting makes its appearance. If you have never had anything with licorice root in it before, particularly in a tea...don't be surprised to find that the tea is sweet. 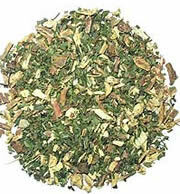 Licorice root is a natural sweetnener and thus essentially drowns out any other flavors that may present. Indeed, to the uninitiated, it is almost like someone added sugar to it, although no sugar is in the tea. Thus, if you don't like sweet teas...probably best to stay away from this particular tea. All the more so since the after-taste is particularly sweet...and very, very long lasting too. Recommendation : Yes and no. This is NOT a mint lovers delight. Despite the aroma, this tea really tastes like licorice. And since this tea contains licorice root, it is very sweet. Whether or not you like this tea depends on how much you like licorice and sweet teas in general. Also be forewarned that the after-taste is like the energizer bunny...it just goes on and on and on...leaving a sweet taste in your mouth for nearly an hour after the tea is gone.